Do Marathon Runners have the freedom to run? 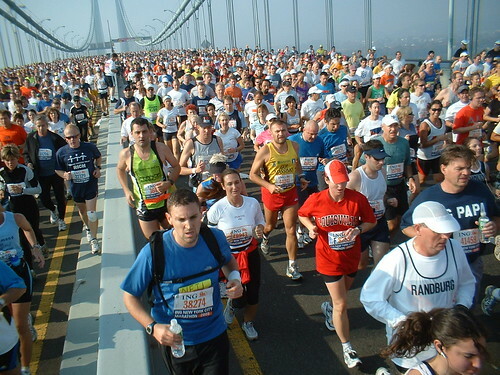 Forum » News / Front-page » Do Marathon Runners have the freedom to run? Marathon Runners don't trust the OSP nor the CNS. The only option for Marathon Runners is to take a RAND-Z license, with the risk to have their "freedom to run" taken away by the patentee. If any one of these runners is in any way uncomfortable with the OSP for this then they also have the option to select the CNS, or to come to Microsoft for a separate RAND-Z license. If you know the terms of the RAND-Z license, I am interested to have a copy by email. You never know what kind of nasty legal tricks they are putting in there to exclude your freedom to run. Re: Do Marathon Runners have the freedom to run? Okay, Benjamin, I think you should add a reference to the article in Oliver Bell's blog. I know there is a reference but the article becomes a bit esoteric otherwise. It appears that Microsoft has about 280 patents around OOXML and related technologies. It also has a large number of patents that read on ODF. We're making a list of these and hope to be able to publish them soon. There are also several patents from third parties that read on OOXML, and in theory ISO should halt the process while these are examined and cleared. It looks like ISO won't do that. Microsoft has several techniques to keep OOXML a captive standard [digistan.org] controlled by a single vendor. Complexity is one. But patents are the very best technique. Note also that OOXML's complexity is mostly because it's a dump of a legacy format. Some upcoming MS ISO proposals are very clean technically, but also very heavily patented. It seems clear that the OSP is worthless for GPL implementations, the biggest threat to Microsoft. At the same time it's worth noting that the format being voted on by ISO is not the format implemented by Office. There are over 2,300 changes and the two formats are not compatible. The reason for pushing for ISO standardisation is to let MS market their formats as "standard", while in fact implementing non-standard vendor-specific formats. And then, using patent threats against anyone who tries to reverse-engineer those. It's a nice con trick. Many national bodies have realized what's going on but many are too corrupted or too ignorant to understand. You have to ask a running license to the guy with a white cap. He knows a lot about what RAND means. Great for the Marathon Runners to have the rights for everything needed to implement OOXML…yet for what did they get rights for exactly? … this Promise also applies to the required elements of optional portions of such specifications. What if stuff are not required, but instead deprecated and outside the standard…. Brian Jones have told that Microsoft from 15 feb 2008 will offer documenation about the legacy formats covered by the OSP, but this means little since the OSP does only cover required parts. I would say that most likely Microsoft has patents not over the required parts, but instead over the more complicated optional things included in all Microsoft formats. Even worse the documentation presented is reported as lacking in detail and missing substantional parts by people checking the documentation. It is not very surprising they kept the documentation hidden until this month to prevent this to be discovered before the BRM. I hope that we can get this information to the BRM groups so that they don't fall for the "it is all documented by now" ploy.